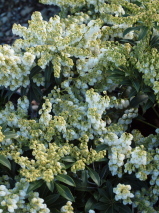 > Pieris japonica 'Purity' - Lily of the valley shrub. Decorative colourful evergreen shrub. 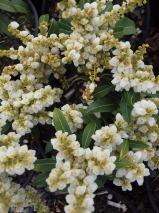 Forms a neat compact bush with glossy green leaves. Dense panicles of large pure white waxy flowers cover the shrub in spring. Grows best in good soil that does not get too dry, and semi-shaded site. Hardy to cold. Lily of the valley shrub. Prefers a semi-shaded site / Prefers a sheltered site / Will tolerate very hard frosts.